I remember the Quickmill thread when the first one turned up on HB, looks like a nice machine, will do the job very nicely Lacehim. I reckon it would be up there with the Izzo & Bosco in terms of quality and finish. I too remember the thread on HB, the video wasn't the best but the machine looked great.. I hope the wife doesn't freak out when she gets the visa bill! I'm a huge fan of the Profitec Pro 800. After approx 7-8 machines over 10+ years I think this is the end point. It's an absolute beauty. 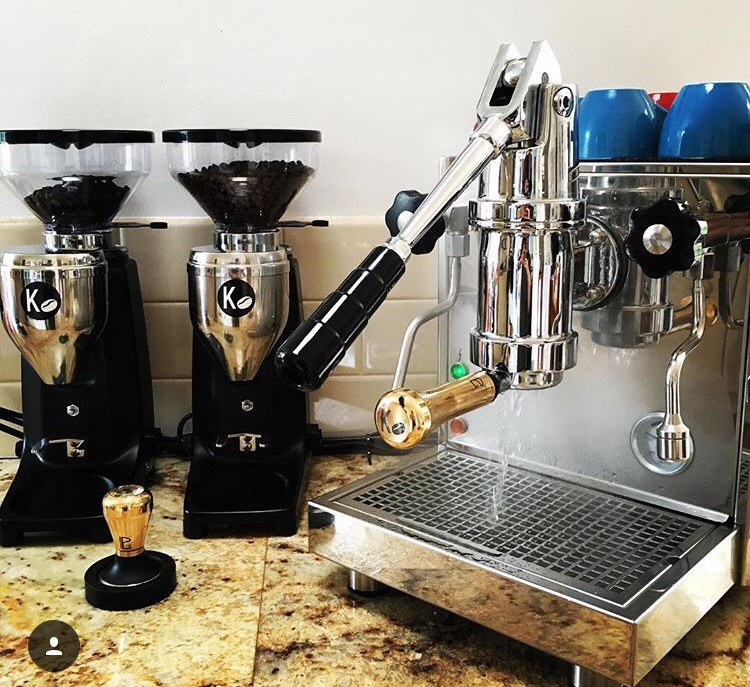 It's a true "classic Italian" dipper lever machine with a PID hidden away behind the drip tray. Yep! What's the price-point compared to the old Strega and UK's Linoleum R1?? Do you actually use the PID and if so, how often? It's a class above the Strega but you pay for the privilege. RRP is approx $4700. It's a dream machine though. Whisper quiet (pumpless) when plumbed in. Also, a true dipper with a classic CMS group. I know the Strega well. It's OK for the $, but it's really an entry level Lever with compromises to keep the price down. Shame I'm not closer to you to try one out. Agree with your respectful assessment of the Strega. I love levers (have two now) but even at 2600 the Strega came up short for me. Enjoy mate! Yes, I use the PID to get the best temp for a blend. If I have a coffee that's a little acidic I'll increase temp. If it needs a little more brightness/florals I'll decrease temp. I know you love your Strega. 2. Plastic cover on top of the lever. 4. It needs more weight at the back at it can tip forward when you pull the lever. 5. You can't add pressure during extraction. You can reduce pressure by holding then lever back, but you can't increase pressure by pushing the lever forward. 6. The pump is noisy. Noisy pumps are my major gripe with all Bezzeras. An aftermarket PID fitting is a good option but by the time you pay for that you may as well have spent a little more to get a real dipper. If I had $3k I would be buying a quality HX with and e61 would be my choice. There are so any great HX machines at just under $3k. Sorry to sound negative but believe me, all the points above are my honest assessments. If you have a Strega, take a look at something like a Profitec Pro 500 and you'll be blown away by the difference. It's apples and oranges. I completely agree and it's funny you say but when I had $3k I tried the Strega and went straight out and bought a HX PID! Luckily for my bank balance at the time this wasn't available! PIDed HX..... I'm guessing that's a Giotto V3 PID Brett. Am I correct? So, if your coffee is a little acidic, you increase the temp. Please explain what and how, as the lever is a huge chunk of metal, and I am interested how you can accurately increase its temp. Where is the temp measured and how is the increase occurring? If it needs more brightness/ florals (acidity in my language) then you decrease the temp. So at higher temps you are getting a lacklustre coffee, and at lower temps it is acidic. Too many variables that are not clarified, such as depth of roast, type of bean etc, etc. I am a firm believer in simplicity, and am not convinced a PID is needed on a properly built and designed lever. Temperature stability is more important. Pull 6 espressos, one after the other, with a reasonable time lag in between for prep etc? Assume machine has heated up (say 30-40 minutes). For Example, using the same dose, and grind, pull 6 espressos without any adjustments. What is the result in each cup, and how much does each pour differ? All Levers are wonderful, it just takes the right person to bring out the magic in them. Some believe that only one type of group, made by a particular manufacturer surpasses all others. Others state that by using a smaller group size (less than the industry normal 58mm), the results are superior due to the depth and shape of the "unique" basket. Personally I think that not having a 58mm basket size, is a disadvantage. Classifying certain levers as high end is nothing more than "shop talk". It is hard to define what makes a machine high end. Price is not necessarily a true indicator of quality. Some high end espresso machines (expensive) are very temperamental, high maintenance and prone to break down. My imperfect (no precision laser cut panels here), lack lustre (no PID or renowned group) lever is still going strong, is very low maintenance and still manages to produce sensational coffee. The design is proven and tested (over decades), and copied by many. Coming from an artisan workshop, it would be sacrilegious to defile it hipster style, with unnecessary electronics. What, not even Underglow lights and spinning light-up dials?? Surely any lever with a rotary pump and 4+ litre boiler can be considered high-end if merely for the thermal stability and commercial parts. I'm not interested in a PID because I don't drink lighter roasts as espresso but the bragging rights conflicts me. I mean sure we talk about category killers but I'm here to talk coffee not be a snob; but, if the old QM Achilles dies Ill come looking for a great price K-bean! I will expect Underglow!!! ...... can be considered high-end if merely for the thermal stability and commercial parts. I'm not interested in a PID because I don't drink lighter roasts as espresso but the bragging rights conflicts me. Just thought this thread is the right one for me to share this vid of me pulling a shot on the Profitec Pro 800.